Officials running the Army’s long-awaited program to equip soldiers with a wearable computer system are sick of hearing about smartphones. Smartphones embarrass them: The Nett Warrior program and its predecessors have spent two decades trying to give soldiers tools for communications and mapping that smartphones currently offer. The results? Mixed, at best. Of course, it’s not as simple as that: Civilian smartphones rely on billions of dollars’ worth of infrastructure to work, and they don’t have to be built to survive Afghanistan. But now, with little choice, Nett Warrior is taking the plunge and embracing the smartphones it once tried to avoid. 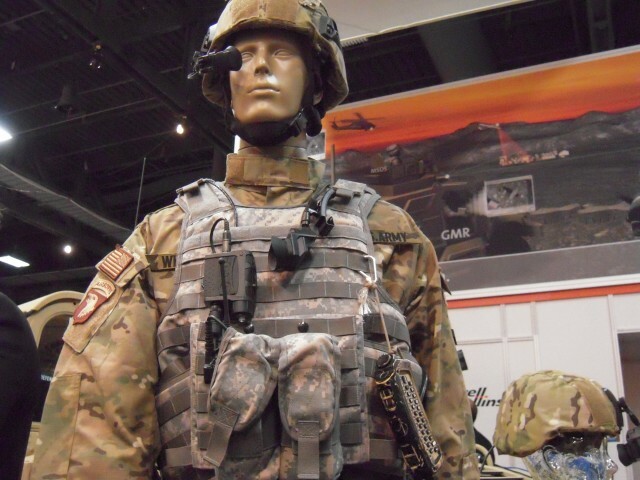 In late July, the Pentagon’s acquisitions overseers put Nett Warrior on ice, while they reviewed whether it made any sense to make soldiers wear eight pounds of gear to do less than what a few-once phone (plus a tactical, encrypted radio) can offer. Evidently, the answer is no. A new solicitation from Nett Warrior is basically preparing to go shopping for smartphones. It’s a spree that’ll make Google happy: The Army is insisting that the phones be powered by Android. That sounds a whole lot like Nett Warrior’s main device has now been reconceived as a phone. Just last fall, three different defense companies — Raytheon, Rockwell Collins and General Dynamics — were putting together Nett Warrior designs that relied on portable computers with peripherals like eye displays, radios and mapping tools snaking out through cumbersome cables. See that picture above? That’s Rockwell Collins’ Nett Warrior design. Check out the banana-shaped keyboard dangling from the body armor. A touchscreen “suitable for use with fire retardant gloves, in wet or dusty conditions” might require some reworking. But not a ton. Fuller’s suggestion: Don’t kill Nett Warrior outright, which would be a bureaucratic hassle. (Not to mention an embarrassing concession that the Army’s acquisition system is so cumbersome that it missed the entire smartphone revolution.) Reconfigure Nett Warrior to maybe phase in smartphones. Fuller’s gone now — he’s helping train the Afghan security forces — but that appears to be exactly what’s going on. It’s a concession to an emerging internal trend. The Army is crazy for apps and plans to launch its own app store very soon. Its vice chief, Gen. Peter Chiarelli, gushes about the Army’s new data network and raves about how well generic, commercial smartphones handled network usage during a recent test at the White Sands Missile Range this summer. Incoming Chief of Staff Ray Odierno may soon decide whether to require soldiers to carry smartphones as a standard piece of gear — and if he’s got the money to pay for it. Seen in that context, it doesn’t make sense to have Nett Warrior as a separate communications tool. Army representatives didn’t return repeated requests for comment by press time. That meant we couldn’t answer one of the biggest questions the solicitation poses: whether Nett Warrior’s acquiescence to the smartphone is the program’s redemption or, ultimately, its death knell.